The steadily increasing voluntary adoption of say on pay in Canada—in 2013 80% of the S&P/TSX 60 companies and 130 Canadian companies had say on pay advisory votes. Influence of proxy advisors—a recommendation against say on pay by ISS and/or Glass Lewis correlates with a significant reduction of votes in favour of say on pay. Increased shareholder activism—the number of activist proposals, the size of companies they are interested in and the willingness of more traditional investors to partner with activists are all on the rise. Performance is no longer a guaranteed protection from shareholder inquiry or challenge. Often high on shareholders’ lists of concerns are: board governance issues (board leadership and director tenure and diversity), CEO succession (bench strength for future leadership transition), and executive compensation (pay for performance misalignment or poor Say on Pay vote results). Consequently, shareholder engagement initiatives frequently explain the company’s approach on these issues, as well as reinforcing key messages about the strength and future opportunities for the business. It is critical that engagement provide good information on issues of interest to shareholders if it is to be viewed as valuable to shareholders. 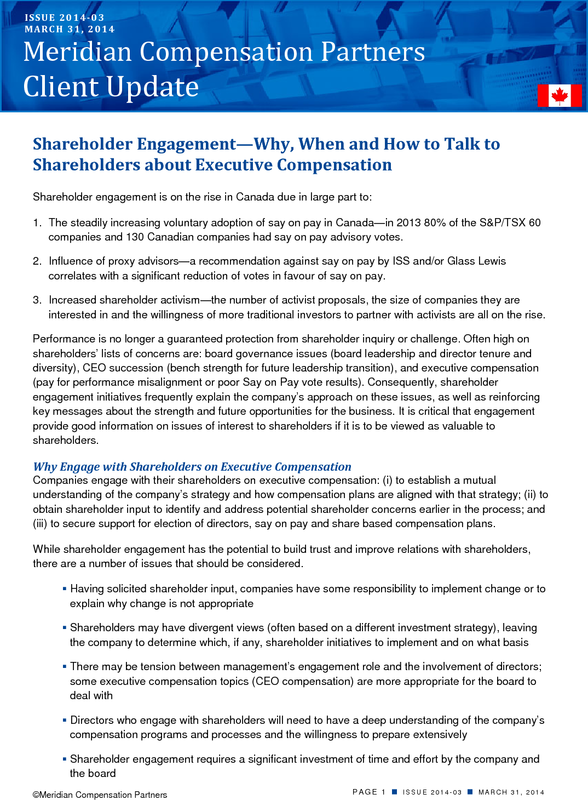 Companies engage with their shareholders on executive compensation: (i) to establish a mutual understanding of the company’s strategy and how compensation plans are aligned with that strategy; (ii) to obtain shareholder input to identify and address potential shareholder concerns earlier in the process; and (iii) to secure support for election of directors, say on pay and share based compensation plans. While shareholder engagement has the potential to build trust and improve relations with shareholders, there are a number of issues that should be considered. The CCGG supports regular, constructive engagement between directors and shareholders in the areas of governance, compensation and disclosure. CCGG has a model engagement policy on their website (http://www.ccgg.ca). Ideally, shareholder engagement is a year round initiative. The least effective time to begin engaging with shareholders is after the circular has been published, and proxy advisors have released their voting recommendations. If the company is engaging with a proxy advisor the engagement should be scheduled well in advance of the start of the annual general meeting season. The management information circular and other required public disclosure has long been a primary way to provide information to shareholders. The circular should be designed to provide critical information and respond to shareholder expectations and anticipated concerns. Many Canadian circulars now include both a letter from the Chair of the Board and a letter from the Chair of the Compensation Committee both of which highlight key information about the company’s performance and its compensation. Disclosure practices have shifted significantly over the last 3 to 5 years—from a technical legal document with only the information required by regulation to an advocacy and public relations piece with additional voluntary disclosure (like realized/realizable pay) and graphs, charts and call out boxes to make it easier to understand. Today’s circular needs to be clear, well organized and to provide information about the alignment of pay and performance. Companies are finding new ways to communicate with shareholders, including virtual AGMs, web-based surveys, governance roadshows, social media, conference calls, and supplemental written communications. Company websites have become essential tools that allow investor relations to engage with shareholders. The investor relations page should be current, easy to navigate and include all the major public documents (annual reports, proxy circulars, annual information forms and earnings conference call transcripts, slideshows and webcasts). Who should attend the meeting? 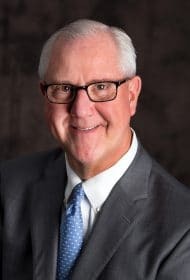 Management is often reluctant to have members of the Board engage with shareholders, however, this engagement is appropriate (even critical) if the agenda includes executive compensation programs, pay for performance or succession planning. Management should also be in attendance at these meetings, although if the focus of the discussion is on executive pay, management should be represented by someone other than the CEO. What information should be provided at the meeting? Care must be taken not to disclose material non-public information. 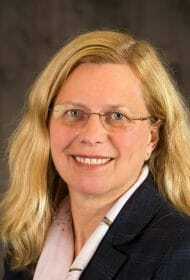 When the meeting is to provide information or persuade shareholders, publicly available information, such as the company’s performance relative to a peer group, a look back on realized pay or a discussion of the company’s process for setting annual incentive plan metrics, may be appropriate. Many investors are not compensation experts; companies can use outreach as an opportunity to explain how their compensation programs operate. Which shareholders should the company engage with? The reason for the engagement will inform the selection of shareholders. A company will generally meet with its significant shareholders to build or retain its relationship and to understand their perspective on its compensation programs. A company may also wish to engage with a particular shareholder to resolve a matter that would otherwise be the subject of a shareholder proposal or hostile proxy contest. Engagement should generally be proactive and designed to build long term relationships with shareholders, rather than purely reacting to concerns raised by shareholders, however, once the foundation has been built, the relationship can and should be used to facilitate engagement on issues and challenges as they arise. Committee planning and discussion regarding the approach to shareholder engagement should form part of the annual work plan. Regardless of the form of engagement, the content should be consistent with the engagement policy and disclosure procedures should be followed. The key is for all participants to prepare—this ensures that the company’s position is consistently explained, and minimizes the chance of inadvertent inappropriate disclosure.